My top 3 traffic referrers: Direct, Pinterest, Google. While I understand that I could do this, I don’t want my website traffic to suffer because of it. I don’t want my business to suffer because I’m away doing something I love; I want my business to run smoothly and profitably while I’m living life and doing what I love. One of the reasons why my course and ebooks sell consistently each month is because I write blog posts that promote them. Without my blog, my business would sink reeeeeeal fast. I don’t think it’s necessary to blog every week if you can’t, but I do believe that consistency is essential when it comes to blogging. If you don’t blog consistently, your blog readers will find other bloggers to follow and your sales will start to slow down. If you’re going away for any period of time, I can’t stress how important it is to make sure your content is scheduled ahead of time! It will help your business run smoothly while you’re away. 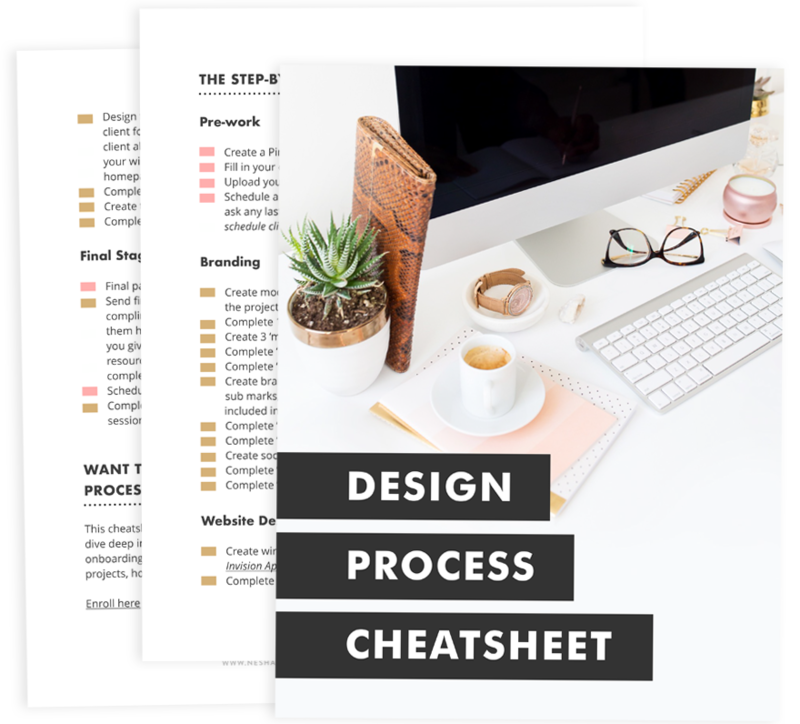 You guys may be aware that after I launched my signature course, Organize & Automate, I set up a free webinar replay called Streamline Your Design Process. It was a replay of my most profitable webinar ever and people just had to sign up to watch it. Then, Convertkit would automatically send them a series of emails promoting my course. I recently created a new sales funnel, The Designers Guide To Project Management, and I’m super happy to report that it’s doing a lot better than my old funnel. Before I’d even promoted the course, I had people see it on my site and sign up, then two sales rolled in! That’s two sales that didn’t come from webinars or blog posts or any kind of active promotion. They simply saw the new free course on my site, signed up, and the free course convinced them to buy O&A. I’ve been using Deadline Funnel to give each of my subscribers a unique deadline. When someone signs up, Deadline Funnel sets a timer for 9 days and shows them a special offer on Organize & Automate. If they enroll before the deadline runs out, they get the bonuses. After the deadline, Deadline Funnel redirects them to my usual sales page and removes the bonuses. I moved to San Juan Del Sur, Nicaragua, and I’ll be living here until the start of February, doing volunteer work. Some people think it’s crazy to go abroad and do volunteer work that you aren’t even paid for, but I absolutely love it. It gives me a real sense of purpose and direction. I’d be lying if I said I wasn’t scared about how this move would affect my business. I’m scared that I won’t be as present in my business. I’m scared that people will forget about me. I’m scared that my business will get on top of me, or there will be some kind of big emergency that I can’t deal with very well from where I am. I know that most of my fears are just made-up situations that aren’t going to happen though. I know that moving to Nicaragua for 3 months is going to be one of the best things I’ve done with my life so far. And I know that no matter what happens, I won’t regret doing this. Make passive income. While I’m away, I won’t be doing much one-on-one work, so I’m focusing on ways to boost my passive income. This will be my main goal this month! Stay socially active with my online community. I don’t want to fall off the face of the online earth while I’m having fun here in Nicaragua. My goal is to stay active on social media as much as I can. I haven’t decided if I should hire someone to take over my social media or not, but I know for a fact that I NEED to keep in touch with my community. I’d hate to go home to online crickets. Republic of Freedom. This is swiftly becoming one of my favourite blogs! I love the way Heather, the blogger, writes, and I love her take on running a business while still living a life of freedom. The Blonde Abroad. I’ve always read a lot of travel books and blogs, but this is one of my favorites. If you’re thinking of traveling more or living abroad for a while, I recommend you check this blog out! Adventures in lady travel. I bought this book by Sarah Von Bargen because I wanted to learn all I could about lady travel and staying safe. Even though I haven’t gone on this trip alone (I’m with three friends), I’ve found it amazingly useful. This book is FULL of tips and tricks to help women travel safely, run a business on the go and have fun! All content, designs and graphics are mine unless otherwise stated.